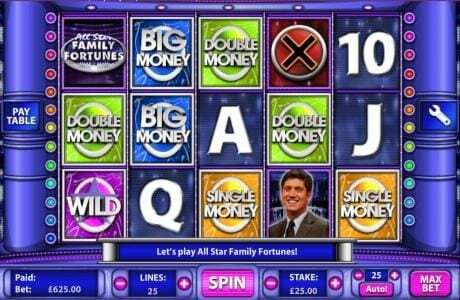 All Star Family Fortunes is a 5 slot reel slot with a maximum payout of $25,000 using the TV show theme. 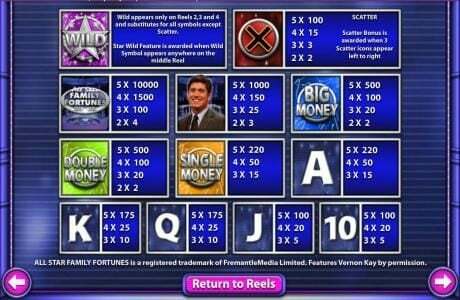 All Star Family Fortunes Slots has not been reviewed yet, be the first to rate this slot. Family Fortunes, an OpenBet game that has 5 reels with 20 paylines, pays jackpots of up to $25,000, and has as features scatter symbols, Free Spins, multipliers and wilds. 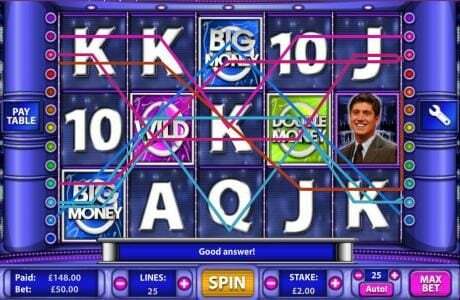 At the basis of this slot sits one of the UK’s most popular TV shows, which is called Family Fortunes. The game has in the background the slot’s stage and the spotlights, while the symbols are a combination of stars and playing cards for the most part. You get the playing cards from J to A at first, and they are simple enough. The paytable continues with the four types of stars, each one of a different color (orange, purple, blue and yellow). The question mark symbol is next, with the game logo symbol being the last one that pays cash prizes. The slot includes the game’s soundtrack, and it plays whenever the player spins the reels. At various times during the game, additional sounds taken from the show will play. The symbols have their own animations, so quite a bit of work went into making this slot as realistic as possible. The game has as the maximum bet a $500 option, which bets $25 coins on each of the 20 paylines. The player can reduce the coin value down to $0.01 if he wants to though, so it’s not only a high roller slot. The top jackpot in the game is 1000 coins, or $25,000. Getting that top jackpot of 1000 coins is possible during the Double Money feature, where you get the line to pay both ways. The regular top jackpot is 500 coins, awarded when there are five symbols with the game logo on the same payline. The prize will drop to 150 coins if there are only four symbols though, and even lower, to 75 coins, if there are only three. You get the wild symbol in Family Fortunes, and it acts as a substitute for most of the symbols, the exceptions being the symbols marked with Big Money and Double Money. 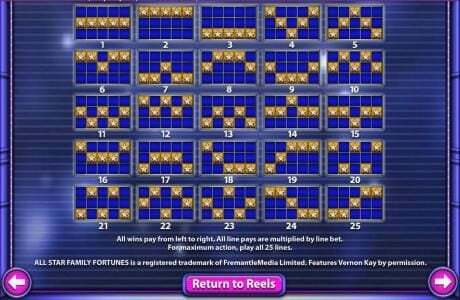 The Double Money feature is the one with free spins, and you get it when there are three logos on the paylines from 3 to 5, the only possible locations for them. The second feature, called Big Money, requires three symbols with the same name. The game asks questions, and gives six options that the player has to pick from. If the answer is correct, the player wins a prize. While it might seem like any other Slot for the most part, if you’re a fan of the TV show I’d definitely recommend you give the game a try as well.